The Ministry of Tourism and Culture Malaysia and its promotional arm, Tourism Malaysia, are ramping up international promotions to all major markets, including the GCC countries, in addition to focusing heavily on increasing accessibility to Malaysia via various airline partnerships, TTN learned while on a recent press trip to Langkawi, hosted by PATA Travel Mart. “We will launch new packages between November and December, which will have special orientation for Arab travellers,” the Langkawi Development Authority (Lada) chief executive officer Datuk Azizan Noordin told TTN. The Middle East arrivals are important for Malaysia as not only are they top spenders but they also stay the longest – between seven to 10 nights – in Malaysia. According to statistics from Tourism Malaysia, tourists from Kuwait, the UAE and Saudi Arabia spend more compared to tourists from other countries. For the first quarter of 2018, Saudi Arabia is still ranked at No 1 in terms of per capita expenditure at RM9,328.7 ($2, 255) even as it is down by seven per cent while it is No 2 in terms of per day expenditure at RM992.4 ($240), down by nine per cent. Arrivals from traditional top performer Saudi Arabia declined by 1.8 per cent to 21,932 in the first quarter of 2018, according to statistics from Tourism Malaysia. The declining trend started last year when arrivals from Saudi Arabia fell by 16.6 per cent to 92,789 tourists for the first 10 months of 2017, whereas arrivals from the UAE were down 38.9 per cent to 7,255. Limited air connectivity, reduced promotional budget for the region; competition from countries such as Cambodia, Thailand, Vietnam and Indonesia, and an early Ramadan this year were the main reasons cited for the downtrend in the arrivals from the region. Also, emerging hotspots such as Turkey, Georgia and Azerbaijan are becoming a favourite destination for Middle Eastern travellers largely due to low airfares offered by low cost carriers (LCCs) and short flight period of three to four hours. “Traffic has dropped from the Middle East mainly because of new hotspots like Azerbaijan and Georgia have emerged which are being marketed aggressively,” said Nicole Koo, director of sales, The Danna Langkawi, a five-star resort built with Colonial - Mediterranean inspired architecture. Koo was one of the 67 Malaysian sellers participating in the PATA Travel Mart 2018. “Middle East market currently constitutes less than 10 per cent for us. But we see a potential target of 20 per cent for the entire GCC market,” said Kavi, group director of sales and marketing at De Palma Group of Hotels & Resorts, Sleangor Darul Ehsan in Malaysia. According to Kavi, De Palma group offers Shariah-compliant packages to the GCC market, customising them with facilities for comfortable rooms, halal restaurants, up to date meeting and banquet facilities to the provision of surau facilities with full time imam who leads the performance of daily prayers. Talking to TTN, Tourism Malaysia officials conceded that there is a general lack of awareness about the destination and much of the focus is only on the capital Kuala Lumpur, which with its Petronas Twin Towers, is too similar with more accessible Dubai. “Tourist arrivals from the Middle East are not as high as from the Asean countries but it is one of our potential markets,” said Mohd Hatta of Tourism Johor, who recently participated in the Arabian Travel Market (ATM) in Dubai. According to Hatta, Johor Bahru is an ideal destination for Middle Eastern travellers who are primarily looking for theme parks, shopping and beaches. The state boasts of four major theme parks: Legoland; Hello Kitty; Angry Bird and Desaru Coast. However, the major challenge is the connectivity, he added. Malaysia’s Tourism, Arts and Culture Minister YB Tuan Mohamaddin Ketapi is nevertheless optimistic that the tourism industry will flourish in light of upcoming infrastructure and facilities developments, promotional and marketing strategies from 2018 until 2020, and support from the government and the private sector. “With these new developments, we hope to serve our tourism partners across the globe better and give complete assurance of our commitment to tourism growth. 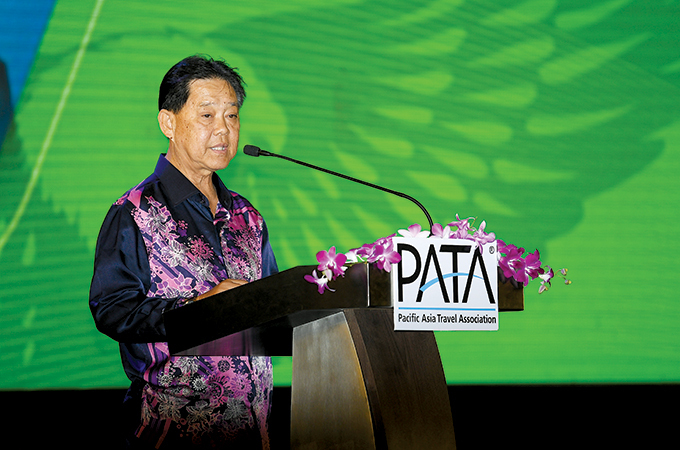 We look forward to seeing our arrival figures grow to 30 million and tourist receipts reach RM100 billion by 2020,” the minister said in his speech at the PATA Travel Mart 2018. Last year, Malaysia welcomed 25.9 million tourists, who spent a total of RM82.2 billion in the country. According to the latest arrival data available, tourist arrivals in the first four months of the year had declined by 3.4 per cent year-on-year to 8.48 million. At the same time, Tourism Malaysia will work with various partners including airlines and travel agents in the region on targeted marketing campaigns, which will use traditional media as well as social media such as Facebook, Twitter and Snapchat. “Our advertising and promotions campaigns have been enhanced with digital marketing and platforms such as Facebook, Twitter, Instagram and YouTube to increase our digital presence and to reach out to an increasingly mobile and tech-savvy market,” said Ketapi. Acknowledging the importance of connectivity to facilitate travel, Tourism Malaysia is focusing heavily on increasing accessibility to Malaysia via various airline partnership for scheduled and charter flights. “The Malaysian government has special incentives for this purpose and Tourism Malaysia is using this to attract international airlines to fly Malaysian routes,” the minister said. Germany’s Condor Air, for instance, will commence Frankfurt-Kuala Lumpur route from November, this year. He pointed out that up until June this year, Malaysia has seen an increase of 14.07 per cent to 2.8 million seats offered per month from a year ago. Malaysia, the minister added, is also positioning itself as a winter holiday destination and tapping into the luxury market and working with Thomson Cruises. Set to commence from December 20 until end March 2019, the TUI Discovery Cruise ship will be homeporting in Langkawi, bringing in a potential 7,200 cruise passenger at end-2018. A TUI Germany office, the first in Southeast Asia, will be established in Malaysia. “The presence of TUI Germany here on our shores is a testament of the confidence that the organisation has in Malaysia,” he said. The government is also looking to promote Malaysia to the movie industry. “Moving forward, our direction for 2018 to 2020 is to optimise digital marketing, focus on industry collaboration, leverage major events for publicity, also leverage megaprojects coming on board in Malaysia, integrate our marketing campaigns with other government agencies and promote Malaysia as a filming destination,” he added. On accommodation, the minister said the hotel sector grew by 8.5 per cent with 250 new hotels in 2017. “Looking ahead, there are as many as 130 hotels with 26,000 rooms coming in,” he said. A number of established hotel brands such as Double Tree, Hilton, Marriot, Anantara, Westin, Mercure, Sheraton, W, St Regis, Four Seasons, Hyatt and others have ventured into Malaysia for the first time recently, while some of them are poised to enter the market in the near future. Moreover, developments such as Desaru Coast in Johor, Impression City Melaka and 20th Century Fox World Theme Park in Genting Highlands are expected to bring renewed interest in Malaysia. The Langkawi Development Authority (Lada), which collaborated with Tourism Malaysia and the Tourism and Culture Ministry to bid for PATA Travel Mart 2018, is pushing hard for more international airlines - namely Qatar Airways, Emirates, Finnair, Thai Airways and Hainan Airlines - to begin direct flights to Langkawi. “In order to get more international tourists to visit Langkawi, we need to get more international flights. We are trying to convince foreign airlines that fly to Kuala Lumpur – such as Qatar Airways, Thai Airways, Emirates and Condor – to also consider flying to Langkawi,” Lada chief executive officer Datuk Azizan Noordin said. According to him, Qatar Airways has firmed up plans to add Langkawi to its list of new destinations and may announce it soon. Qatar Airways’ is already flying four-time a week to Penang from Doha since February. The new Middle Eastern connection has clearly benefited Malaysia’s as well as Penang’s travel trade in spurring tourist arrivals from Europe which had taken a hit following Malaysia Airlines’ suspension of most of its routes to the region in 2015. 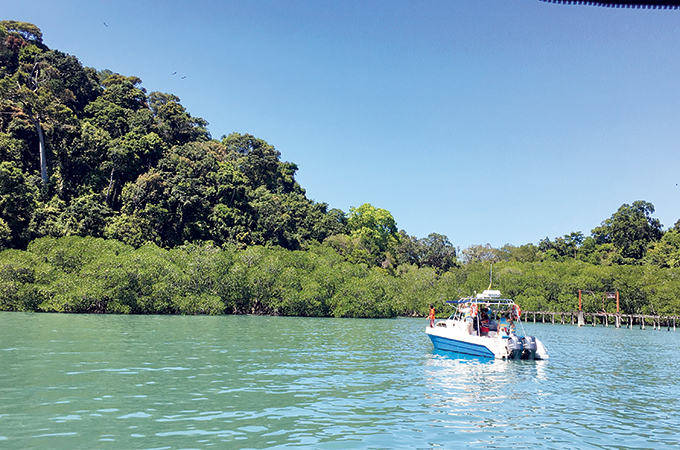 According to Azizan Noordin, Middle East tourist arrivals to Langkawi constitute 40 per cent of 950,000 arrivals recorded in the first quarter of 2018. A total number of 3.67 million travellers visited Langkawi in 2017, an increase of more than one per cent from the previous year, bringing in RM6.53 billion tourist receipts to Malaysia, which contributed hugely to the economy of the island and the State of Kedah. Further, Malaysia Airports has rolled out a slew of incentives for airlines that begin new routes or expand their existing services in the country. One of the incentives - the Joint International Tourism Development Programme (JITDP) with Tourism Malaysia introduced this year -- has a total combined funding of RM15 million ($3.7 million), which is used to assist local and foreign carriers promote Malaysia in overseas markets through tactical campaigns. “JITDP has been well received with campaigns being run by various airlines in Taiwan, Iran, the UAE, Kuwait, Bahrain, Oman, South Korea, India, Greater China and Australia, among others. For some campaigns, the airlines also worked with travel agent consortiums to promote Malaysia as a holiday destination,” Sah said. To further improve international air accessibility to Langkawi, Melaka, and Labuan, the trio of secondary destinations where the Malaysian government is pushing for tourism development, Malaysia Airports continues to provide support to airlines in the form of a passenger rebate incentive for the first two years of an airline’s operation in the destination. The authority also offers a landing fee waiver of one year for new airlines and existing airlines which have either increased their flight frequency or introduced a new route. This five-year airline incentive for Langkawi will end in 2020 and in 2021 for Melaka and Labuan. Currently there are six airlines operating from Langkawi International Airport (LGK) to four domestic destinations and five international destinations with combined weekly frequencies of 238. In 2017, LGK registered 2.7 million passenger traffic movements with a 14.6 per cent increase in international passengers. Till June 2018, international passenger traffic movements have increased by 23.9 per cent compared to the same period in 2017. The year-long airport expansion project for LGK which started in October 2017 has been completed and has increased the airport’s capacity from 1.5 million passengers per annum (mppa) to 4.0 mppa. “We are confident that this expansion will further facilitate LGK’s growth. We are already seeing more interest from foreign airlines to operate from here,” Sah added.